The way the lighter pink tones highlight while the darker hues shade the petals, it makes it look like an artist came through and spray-painted each bloom. 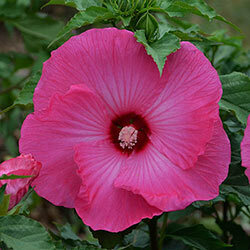 Simply gorgeous, 8-8½" across, give you a long bloom season to enjoy them through. This is a cold-hardy hibiscus. It'll die back to the ground in winter and break dormancy slowly in spring, but don't get discouraged, it grows quickly for an excellent summer show. You'll also get to enjoy butterflies fluttering around the blooms, and as a hibiscus, deer generally won't bother it. Tolerates most soils, except incredibly dry soils, and thrives very well in wet soils.